Whether you’re in town for a weekend or an extended two-week vacation, getting the most out of your San Diego adventure requires a bit of careful planning. While having the ability to be spontaneous is one of the great things about being on vacation, seasoned travelers know that a bit of forethought and planning are often what makes the difference between an “okay” trip and one that is off-the-charts amazing. Before you head out for a night on the town in America’s Finest City, check out these tips for getting the most out of your San Diego adventure. There’s only so much exploring you can do online. You can learn a lot with an Internet search, by jumping on Google isn’t the same as seeing places first-hand. On your first day in San Diego, plan on riding the Old Town Trolley. This tour will take you through all of the must-see spots, including Old Town, Balboa Park, Seaport Village, etc. You can hop on and off as you please along the way, and you will get to see all sorts of spots you may want to check out later in the evening. Keep in mind that the Old Town Trolley only runs until about 5 p.m., so you’ll need to make other transportation arrangements for your evening festivities. Looking for the hottest party in town? Stop by your hotel’s concierge desk before making your way to the club. The concierge staff can recommend the best spots to check out, hook you up with discounts, and sometimes get you on super-exclusive guest lists. Spending a few minutes with the concierge could save you from spending hours waiting in line, and it could even earn you VIP status. Another great thing about stopping by the concierge desk is having the opportunity to talk to someone who actually lives in the area. They may be able to point out a spot that’s a favorite among locals but isn’t as crowded as the popular tourist destinations. Pro tip: Be nice! The people working the concierge next are, well, people, and they deserve to be treated with kindness and respect. They are way more likely to hook friendly hotel guests up with things like discounts and VIP upgrades, so being nice is definitely in your best interest. Being nice costs you nothing and could lead to huge rewards. And even if it doesn’t, you’ll feel good knowing you made someone else’s day a bit more pleasant. San Diego is a huge city made of up several communities. 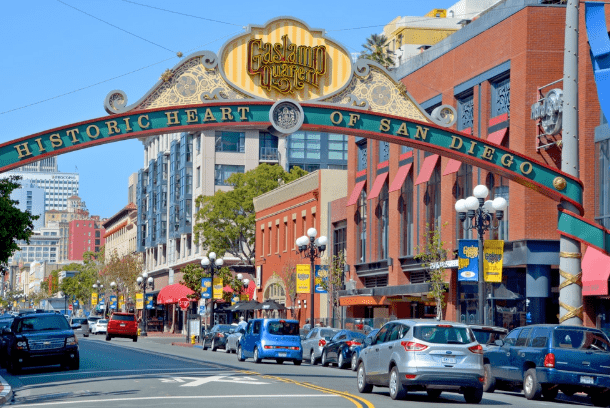 If you are looking for an upscale neighborhood where you can have a few drinks and cut loose, plan on visiting the Gaslamp Quarter. Located in the heart of historic San Diego, the Gaslamp Quarter is well-known as the premier West Coast entertainment district. This area spans more than 16 blocks and is home to restaurants, bars, nightclubs, and more. If you are looking for a truly unique San Diego nightclub, though, a trip to The Oxford Social Club is in order. Situated in the heart of the Gaslight Quarter, this avant-garde nightclub is a swanky destination like no other. It features things like timeless, eclectic music and conceptual lighting to create an upscale atmosphere with a playful vibe. Featuring carefully curated cocktails, bottle service, and much, much more, this club is a perfect spot for enjoying an amazing night on the town in San Diego’s Gaslight Quarter. If you are looking for a unique experience to go along with your favorite beverages, make Coin-Op Game Room a part of your San Diego adventure. Located in the Gaslight Quarter, it is an amazing destination for local craft beer and expertly made cocktails. It is also home to a huge collection of pinball machines, retro arcade games, sports games, and multi-player games. There are more than 50 games to choose from, so there is something for everyone. They have great food, too. The menu features classics like pizza and chicken wings along with local favorites like the Cubano sandwich and quinoa sliders. There are plenty of happy hour drink and food specials, and if you visit on the first Sunday of the month, you can enjoy free play on all coin-op games. If you are in the city and want to enjoy a different type of nightlight, Coin-Op Game Room is well worth checking out. An amazing night on the town doesn’t have to involve going to the club or hopping from one club to the next. In fact, San Diego has a thriving nightlife with plenty of things you can do that don’t involve alcohol. You could attend a baseball game at Petco Park, visit Old Globe Theater to watch a Shakespeare play, or enjoy a concert at Humphreys by the Bay Concerts. If you love movies, visit Rooftop Cinema Club to enjoy a showing of a cult favorite atop the roof of the Manchester Grand Hyatt San Diego. Love animals? Check out a sleepover event at the San Diego Wild Animal Park. No matter what you are interested in, there San Diego has plenty of options for enjoying an amazing night on the town. There is almost always something happening, and the city offers countless ways to have new experiences. Planning a night on the town in San Diego doesn’t have to be difficult. Whether you are into the club scene or you would rather spend your evening doing something a little more laid back, there are plenty of options to choose from. San Diego’s thriving nightlife makes it easy to find something to do no matter when you visit and what you enjoy doing.